For other uses, see Cape (disambiguation). 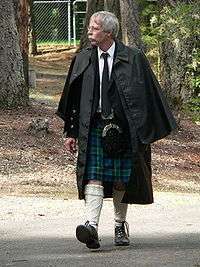 Inverness cape, a sleeveless topcoat, common with Highland dress. Capes were common in medieval Europe, especially when combined with a hood in the chaperon, and have had periodic returns to fashion, for example, in nineteenth-century Europe. Roman Catholic clergy wear a type of cape known as a ferraiolo, which is worn for formal events outside of a liturgical context. The cope is a liturgical vestment in the form of a cape. Capes are often highly decorated with elaborate embroidery. Capes remain in regular use as rain wear in various military units and police forces, for example in France. A gas cape was a voluminous military garment designed to give rain protection to someone wearing the bulky gas masks used in twentieth century wars. In fashion, the word “cape” usually refers to a shorter garment and “cloak” to a full-length version of the different types of garment, though the two terms are sometimes used synonymously for full-length coverings. The fashion cape does not cover the front to any appreciable degree. In raingear, a cape is usually a long and roomy protective garment worn to keep one dry in the rain. In full evening dress, ladies frequently use the cape as a fashion statement, or to protect the wearer or the fine fabrics of their evening-wear from the elements, especially where a coat would crush—or hide—the garment. These capes may be short (over the shoulders or to the waist) or a full-length cloak. Short capes were usually made of, or trimmed in, fur; however, because fur is less accepted as a fashion accessory in modern times, other expensive materials are substituted for it, with an opulent lining and trim. Typical fabrics used are velvet, silk and satin. Capes are still authorized as an alternative to the more utilitarian trench coat for U.S. Army officers in mess dress, formal evening uniform. Caped overcoats were popular for men during the Victorian era, with some caped Ulsters featuring multiple layered capes, and the Inverness coat (both formal evening and working day variants) had a cape. 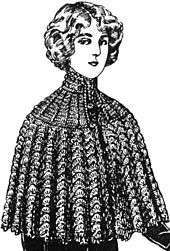 The Inverness coat is no longer commonly worn(though it has begun to be revived, on a limited scale, in steampunk fashion), and the Ulster lost its cape in the 1920s. In modern times, capes are commonly used by hair and beauty salons for the purpose of hair styling services, in which usage they protect clothing from loose strands of hair being cut from the head and/or from the chemicals often used in such styling. Captain Marvel is one of many caped superheroes who are classically depicted in American comic books. The cape is a popular clothing item for superheroes in the American comic book genre. Most often, they are worn merely as a costume adornment. Other times, as in the case of Batman, The Shroud, and Cloak of Cloak & Dagger, the cape serves a functional purpose, such as gliding (Batman), transporting one to the Darkforce dimension (The Shroud), or initiating teleportation (Cloak). The supernatural character Spawn has a cape (actually a part of his living symbiotic costume) that obeys Spawn's mental commands, changing shape to scare, confuse or even kill would-be attackers. In the 2004 Pixar superhero film The Incredibles, one humorous scene involves a flashback featuring superheroes now deceased as a direct result of their costumes featuring capes. The flashback shows, among others, Thunderhead getting his cape "snagged on a missile fin," Stratogale having hers caught in a jet turbine, and Splashdown falling victim to his cape being "sucked into a vortex." Look up cape in Wiktionary, the free dictionary. Wikimedia Commons has media related to Capes. ↑ Pauline Thomas (2007-09-08). "Cloak Line Drawings. Fashion and Costume History 1". Fashion-era.com. Retrieved 2012-04-17. ↑ Capes by Sheena. "Salon Capes". Retrieved 2015-05-10.